Terrain Tundra, glacial mountains, wooded and open fields. Most provinces can trace their histories back to ancient tales of brave pilgrims finding a suitable plot of land and building a village. Icemuse's origins are considerably less mundane. Little of the area north of Agoia Talia in Icemuse has much farming land, and the winters are harsh forcing short growing seasons. It is a predominately frozen land that, unlike neighboring Ulvania, lacks a mountain range to protect its inhabitants from the brutal wind. Few would ponder why people in other provinces would forsake this place. But few did ponder, and of this group, the most powerful mages banded together to create their own society in this frozen waste. Some crafted small magical suns to provide farms with a semblance of regular seasons as in Asylum. 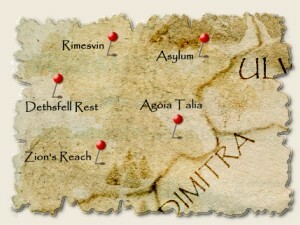 Others gave up on the ground entirely and created floating cities such as Rimesvin. Famously, the city of Dethsfell Rest also once flew through the sky, but now lies crookedly on the ground ever since the Catacylsm. With the ban on magic after that world-spanning event, its ability to fly was never restored though the city continued to grow. In modern times, the eccentric mages that rule Icemuse are known for games of chance and the most elaborate magical items that money can buy. It is currently sunset. The weather is clear.